December was a hard month for me to stay caught up with book reviews (okay, it was a hard month for me to stay caught up with anything), and so I consequently got very behind. But when January came, I vowed to myself that I would just stay current with the books I was then reading, and I would catch up with the ones that I missed as I had time. So that is why, two months later, I'm finally writing about Dinner: A Love Story. Fifteen years ago (that would be in 1998), Jenny Rosenstrach began keeping a daily log of what she and her family ate for dinner. (Think of it as the recently popular line-a-day journals but with food.) At first she did it, in part, so that the meal would last beyond the thirty minutes it took to consume it. The notebook made it possible for her to have a permanent, tangible reminder of what they ate and the memories that went with it. But as the years went by, it also became a record and reminder of family trends, special events, and happy memories. The longer she kept it, the more she realized how invaluable it is to carve out time every night for a sit-down family dinner. 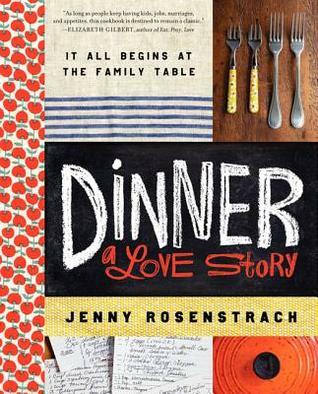 I did not read this book because I needed convincing that family dinner is a good thing. Growing up, it was a rare night when all ten (yes, ten!) of us weren't gathered around the table, and that time together led to some of the best one-minute talks, funniest jokes, and most interesting conversations you ever did hear. But while I didn't need convincing, my resolve maybe needed a little boost. Right now with three young boys, mealtimes have become more of a time to clean up spills, make convincing arguments for why broccoli is tasty, and wipe messy faces than for holding enlightened conversation (though we do try). And incidentally, even Rosenstrach, with all her evidence, says that family dinner may be more enjoyable if you feed the under 3 crowd before the rest of the family. I won't say I haven't been tempted. The thing I really loved about this book is that it was a perfectly blend between memoir and cookbook. I actually read the entire thing straight through, including all the recipes. I felt like the recipes really became a part of the plot, and they needed to be read and, forgive the pun, savored along with the other stories. She would usually group three or four recipes together--recipes that had to do with whatever she was just talking about, be it kid-friendly dinners, easy dishes for entertaining, or lip-smacking barbecue. The recipes were written in a laid-back, easy going way: add "a handful" of this or "a few glugs" of that. Also, she was so realistic--it's obvious that she's a mom and that she gets what it's like to have screaming/wailing children at 5:30pm. For example, for her pizza sauce recipe, she gives the instructions: "Simmer for 30 minutes, but 20 minutes is fine, too, if the kids are losing it." Yes, she knows what it's like. Since finishing this book, I have not started a food journal (surprising, I know, since I'm passionate about journaling). I guess I just feel like we eat so simply that it wouldn't provide any interesting glimpses into our lives, unless of course, "boring" is the new "interesting." And yet, I'm sure there have been trends in our eating--like when we ate about a million fresh pineapples when I was trying to induce labor with Aaron or when we made fruit smoothies practically every evening. I'm sure Rosenstrach benefited from her daily log while writing this book because she was able to make such statements as, "...between January 1997 and October 1999, I don't think [Andy] ever passed up a recipe that called for cilantro." The food journal helped her remember the "cilantro stage." Also, have you noticed how sometimes you'll make a recipe almost weekly, and then one day, you'll just forget about it entirely? Tracking dinners would make sure some of your favorite dishes didn't accidentally fall out of use. Not related to food per se but on a more personal note, when Rosenstrach talked about being the "Wednesday Wife" because she got to stay home on that day and do all of the domestic things she was longing to do, I was struck by the balance every woman has to strike between what she wants/needs and what her family wants/needs. For her, even though a part of her wanted to be with her daughters during the day, she also craved the satisfaction that having a job outside the home brought her. Interestingly enough though, eventually she did decide to work from home (which, among other things, is when she started her website). In many situations, I think it is possible to get what you want; the hard part is deciding what you really want. For all that I really liked about this book, there was one thing that annoyed me more and more the farther in I got, and it was all her references to how much she loved her daily gin and tonic. As just one example: When they were on vacation, her husband, Andy, liked to plan everything out to the minute, including, "...at six o'clock I need to be right there on that deck drinking my gin and tonic." And Rosenstrach followed with, "Now there was a deadline I could get excited about!" Now multiply that example times 20, and you'll get what I mean. And now, the question I'm sure you've all been asking: Have you tried any of the recipes? Although, if you know me very well, then the question you should really be asking is, Has Mike tried any of the recipes? Regardless of which one you asked, the answer is yes, and they've all been successes. This recipe for black bean burritos is my favorite so far. When I took my first bite, it literally stopped me cold and all I could say was, Wow. I had no idea onions could taste like that. Quick-pickle your onions: Bring vinegar, sugar, 2 cups of water, and salt to a boil in a small saucepan. Add the onion and simmer, uncovered, about 3 minutes. Drain. Heat the oil in a skillet over medium heat until hot but not smoking. Add the garlic, green onions, cumin, jalapeno pepper, and salt and pepper and cook, stirring, about 1 minute. Stir in the beans, mashing them with a fork. Add another 1/3 cup water and cook, stirring until most of the liquid is absorbed, about 5 minutes. Toss in corn and remove from the heat. Spread the bean filling across the middle of each tortilla, leaving some space at both ends. Sprinkle each tortilla with cheese, your now quick-pickled onions, and a little cilantro. Fold the ends of the tortillas over the filling, enclosing filling tightly. Heat more oil in a skillet over medium-high heat. Add 2 burritos at a time, seam side down, and fry until lightly browned on the underside, about 2 minutes. Turn over and fry until golden, another 2 minutes. Repeat with remaining burritos and serve with desired toppings. You definitely could get this book and use it just like a cookbook, but I'd highly discourage that. You'd miss out on so much of what makes this book so interesting. We loved the Pomegranate pork loin and wanted to make it again the next night, be sure to try that one. And also, the roast? that you shred over Papparelle? noodles. Something like that, I don't have the book handy. Both of those were out of the park good. You seriously write the BEST book reviews. They are just a pleasure to read. What a great find! I am SO making those burritos next week. Though I am bit scared of the onions - pickle them? Really? Ha! Yes, it sounds like you'd probably like the whole book! :-) I hope you can get it.